Currently, new domains are being created with unwanted PHP version. How to change the default PHP version/handler assigned for newly created service plans? Go to Subscriptions > example.com > Websites & Domains > Hosting Settings > PHP version. 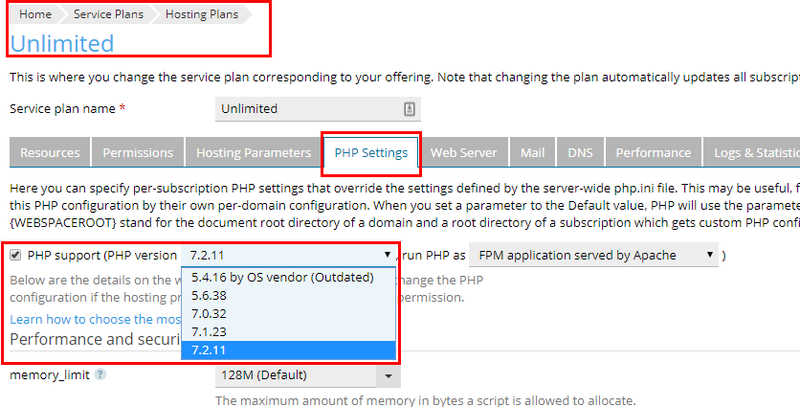 Note: This method will also change the PHP Versions of existing subscriptions if the Common PHP settings management permission is not set. Go to Service Plans select the wanted Service Plan, for example, Unlimited and select the tab PHP Settings. Note: The steps have to be repeated for each Service Plan, in which the PHP Handler should be updated. This functionality is yet to be implemented in Plesk. However, a corresponding request already exists on Plesk User Voice. Leave a vote there - top-ranked suggestions are likely to be included in next versions of Plesk. 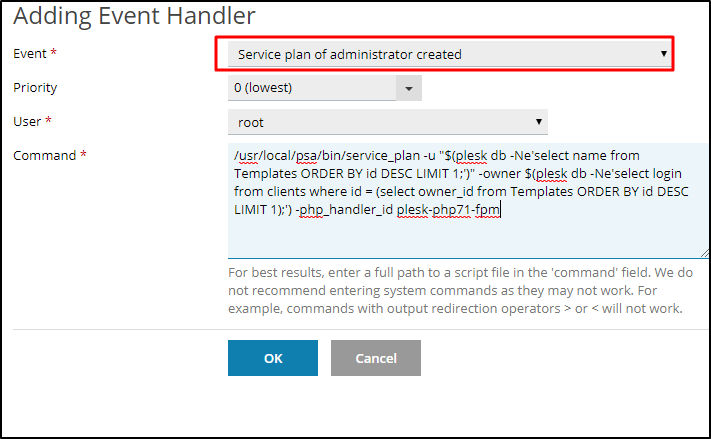 Note: It might be possible, that Plesk does not allow managing service plans via the web interface, this can be the case for example for Web Admin Edition or Web App Edition, it is possible to manage them via command line utilities, as described below. Note: These PHP handler ids may vary on your server, thus it is advised to check. Change the PHP handler for the Unlimited service plan. The hosting plan 'Unlimited' was successfully updated.